Nice notes, but tragically widely interspersed, right? Once you sign up, Oh Life emails you at the end of every day and asks “How’d your day go?” Just respond to the email and they compile it all for you in a pseudo-journal (skeuomorphism!) style. Despite all our complaining, the internet is still full of great free things, I think. It’s decompressing for me too. I find that the wonderful moments bob to the surface of my memory once I’ve written down a few of the more embarrassing and chaotic ones. For example, in the case of the unexpected rainstorm: after we arrived at our friends house totally drenched with Joan screaming, I settled on to their couch and watched Lux learn to cut out hearts and airplanes in sugar cookie dough. Soon it smelled like baking cookies and my sling, Lux’s shorts, and bunny (of course) were spinning in their dryer, and I decided I didn’t need to go to the grocery store that day after all. And that’s really all this week adds up to, I think. Feeling embarrassed, exposed, disorganized, messy, and learning to love it or ignore it, as the case might call for. This entry was posted in Baby, Darn Good Ideas, Other Places Online, Website Reviews by Rachael. Bookmark the permalink. By the way, you’re doing great, and it gets much easier over time. Glad for those little moments of respite after the storm! That is SO good. Just imagine, as I’m sure you have, Adelle referencing that with her first born, and learning so much more than books could ever tell her. Oh I so need this! So many face-palm moments and I’m way past My First Week. 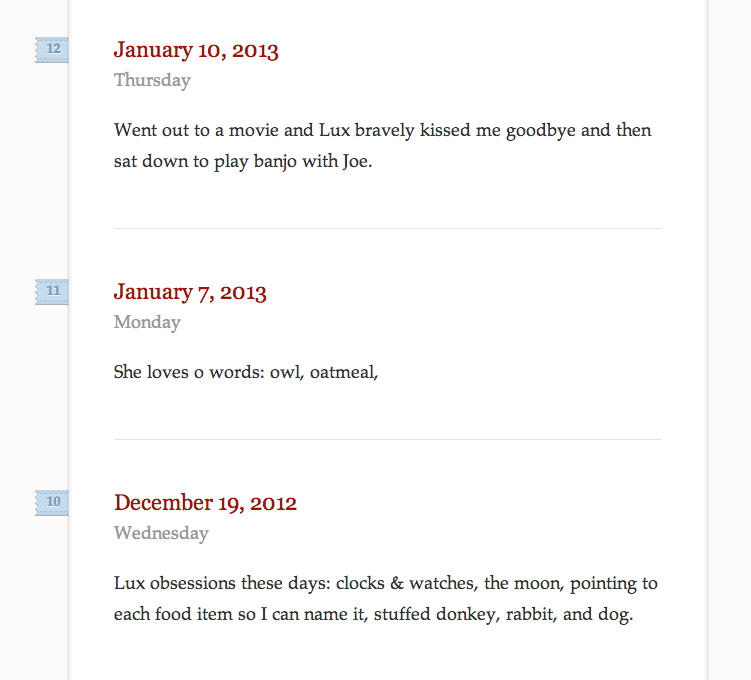 Your blog is one of those things that makes me love the internet. The last few lines brought tears to my eyes. Honestly, I feel like that describes this (nearly) whole first year for me. I don’t say that to discourage you because in so many ways it does get easier, but for me, this first year of mothering two has humbled me unlike anything else I’ve ever done. My view of myself as a fairly put-together person has been pretty much shattered. Which, as I write that, I realize is a good thing. It just hurts in the process. Thanks for sharing this. And how precious are those friends who provide us respite in the most chaotic moments! I saw a mom with a two year old and a four year old and she said it gets much easier! : ) It’s SO hard to give up having your act together and being perfectly perfect. But I can think of moms I’ve encountered who have given up and just enjoy the ride, and they are pretty fun to be around, in the end. I think your writing has prepared me in several ways for this year. I was thinking of a post of yours when I was lamenting the mess Joe was coming home to. Lux has entered a stage where she trashes the apt in about five minutes flat. I can’t spend the whole day cleaning up, it’s pointless! alas. just wanted to say that I’m using Ohlife for almost 3 years now and can’t imagine doing without it. Just hope they continue forever. BTW I believe if they add donation option there are lots of people who will support them this way. don’t you think so? If yes sent them an email and ask them to add this option. I’m just trying to secure the service I love.